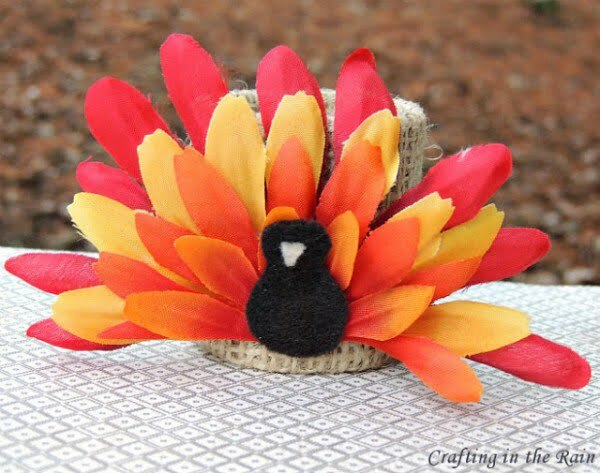 Looking for the best DIY Thanksgiving crafts and decorations to make for the Holidays 2018? Here are our top 30 creative Thanksgiving ideas for you to choose from. With Thanksgiving just around the corner, we all want to decorate our homes to prepare for the occasion. This holiday is not only about festive dinner, but it’s also about decorating the dinner table and the room to create a pleasant experience for everyone. Not only that, decorating your home in a way that you can leave everything up until Christmas is sure to leave a lasting impression as well as save you some work. So here are 30 ideas for easy DIY Thanksgiving decorations and crafts that we love and think are worthy to stay around. Start with a Thanksgiving wreath in the spirit of the fall season with dried branches and colorful maple leaves. The monogram of your family name is a nice addition. What are you thankful for this year? 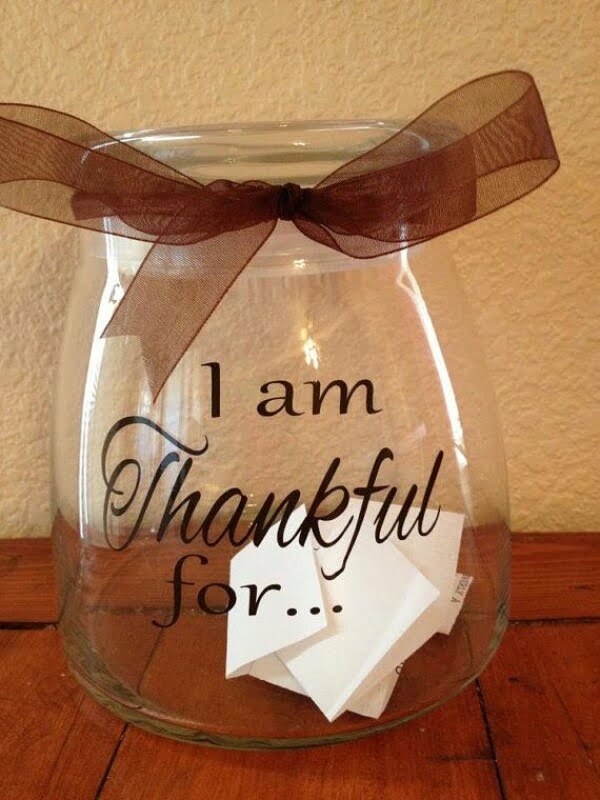 Create a jar at home for all the family and guests to leave a note. The fall season is never without pumpkins, and you can enjoy lovely decor by making a vase from one. It makes a beautiful vignette arrangement or a centerpiece for the Thanksgiving table. If you’re decorating late, you have to do it fast. 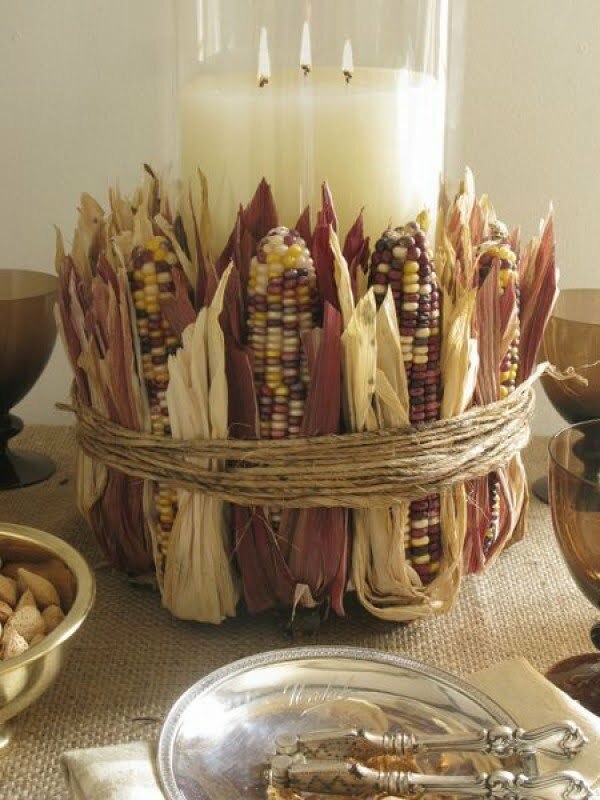 Here’s how you can create quick and easy Thanksgiving decorations that will look beautiful. This technique of transferring print to burlap will allow you to create a beautiful table runner for your Thanksgiving decor. 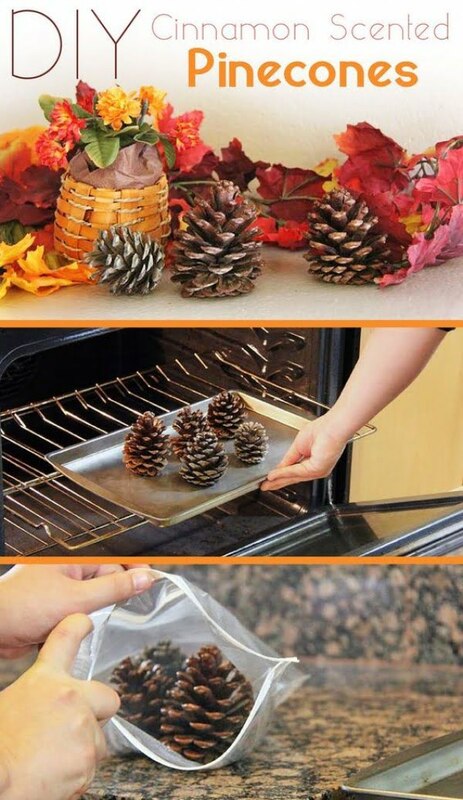 Make these scented pinecones to not only decorate your home visually but spread pleasant cinnamon scent as well. You will enjoy this decor accent for weeks to come after Thanksgiving too. First things first, you have to decorate your front door and porch. 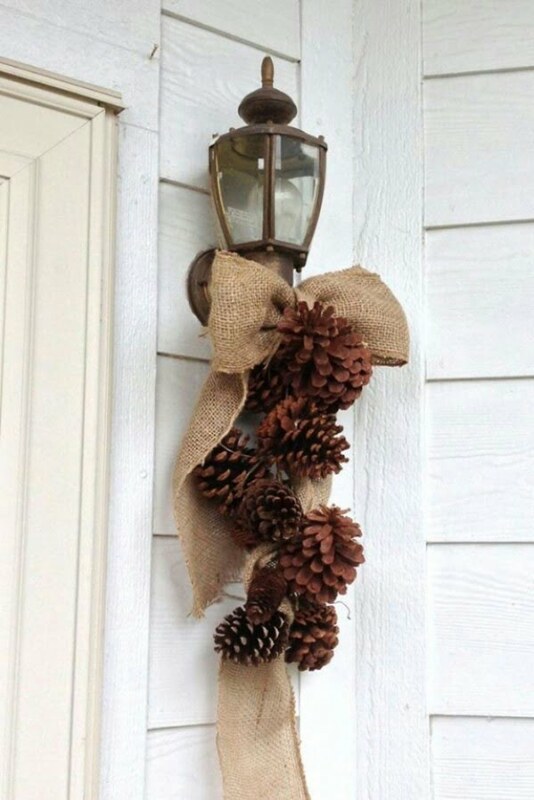 Here’s a lovely idea to decorate it in a simple but adorable way with burlap and pinecones. 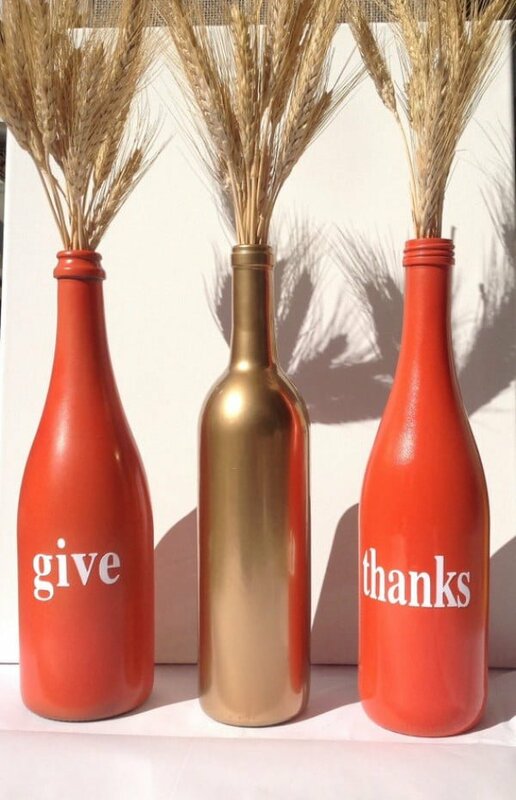 Spray painted bottles in orange will serve perfectly as Thanksgiving table centerpieces. Use wheat or dried branches to create decorative vignettes. Orange maple leave garlands aren’t just excellent fall decor accents; they work well to decorate your doorways and walls for a statement Thanksgiving decor. 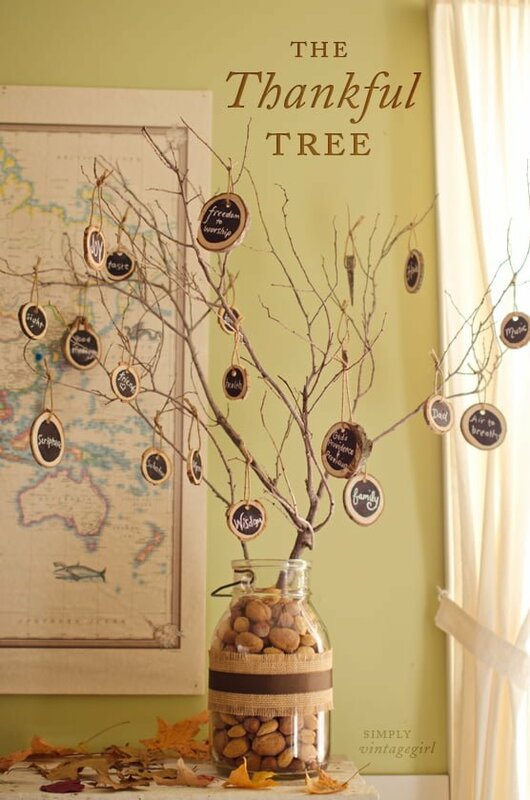 Similar to the Thanksgiving jar, the Thankful tree is a great way to show your appreciation for things you are thankful and create a decor piece of it. 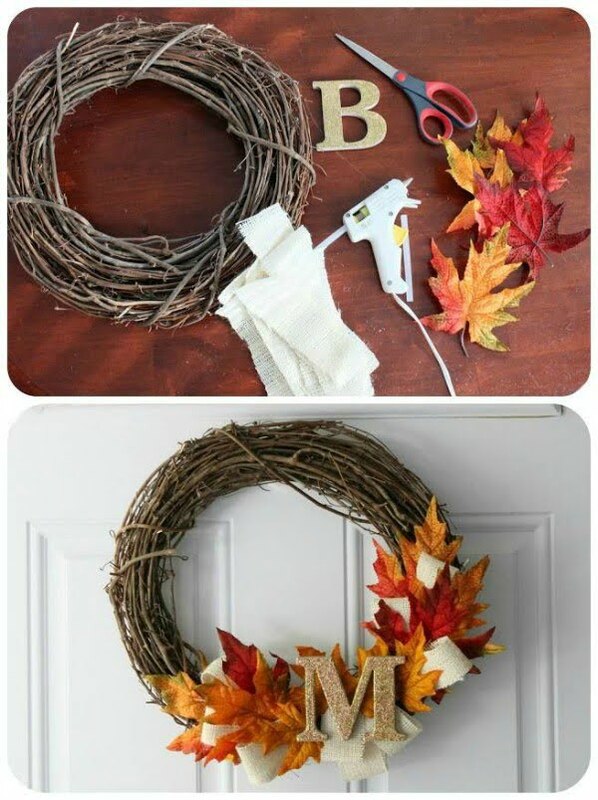 And here’s another easy way to create a Thanksgiving Wreath. It’s the perfect option if you’re in a hurry and want to come up with a beautiful decoration quickly. 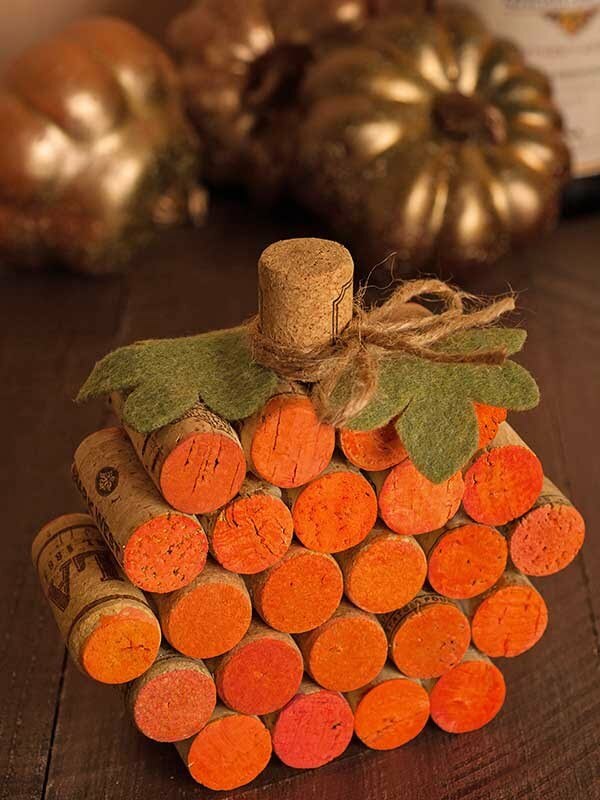 Quirky decor accents like this wine cork pumpkin is a great way to surprise your guests and make your Thanksgiving decor genuinely exceptional. If your Thanksgiving table needs more decorating, try making this whimsical pumpkin serving tray. It will get oohs and aahs from your guests. 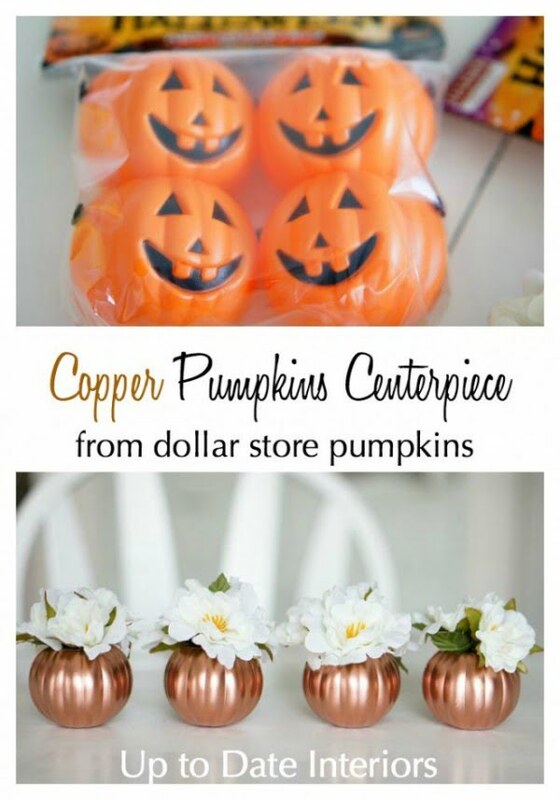 While plastic pumpkin decorations are cheap, you can spray paint them in copper and get a chic style table centerpiece. Your guests will appreciate a modern take on Thanksgiving decor. You can make lovely flower arrangements using a pumpkin as a pot. Follow this easy and simple tutorial to see how. If you’re into woodworking crafts, you’ll love this idea for a decorative wheelbarrow. 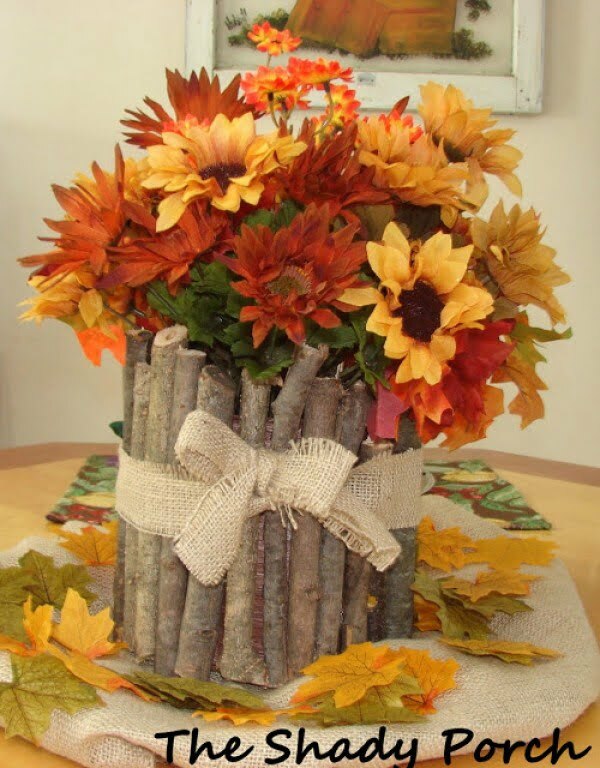 Fill it with pumpkins, flowers and other products for a remarkable Thanksgiving decoration. 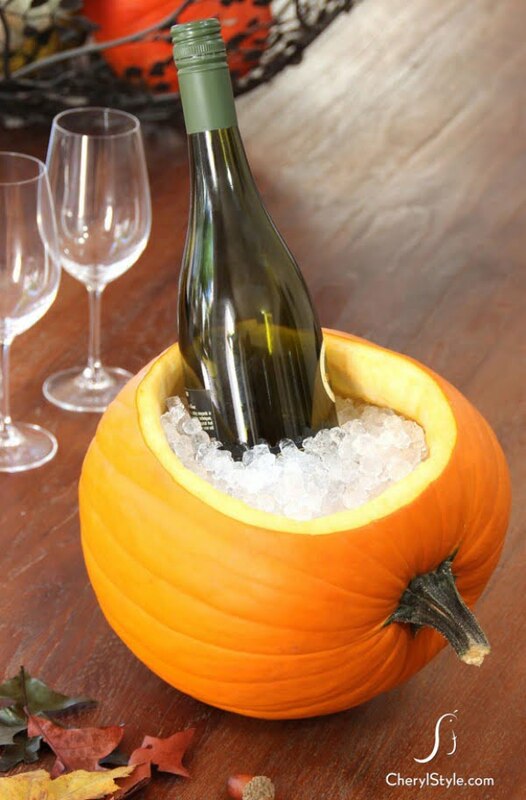 Another great idea for your Thanksgiving dinner table decor is this easy to make pumpkin ice bucket. It’s simple enough, yet it will add a lot of appeal to your decorations. Yarn pumpkins are lovely little accents to add to your decor for Thanksgiving festivities. They are very easy to make too. Corn is another Thanksgiving attribute that you probably cannot do without. Make a centerpiece about it, and it will be the best focal point of your decor as well. Make a unique garland for this special occasion. 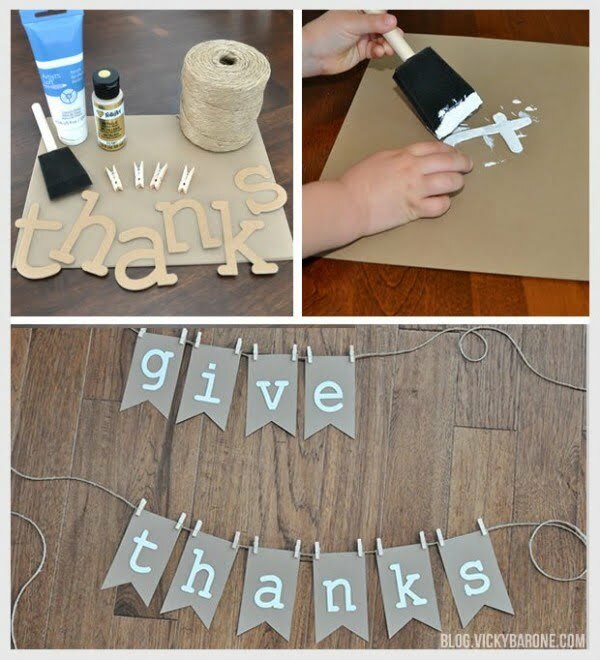 A adorable but straightforward “give thanks” letter garland is the perfect way to do it. This easy to make rustic centerpiece doesn’t take long to make, but it’s a very high impact accent that your guests will love. Try making it from dried twigs. 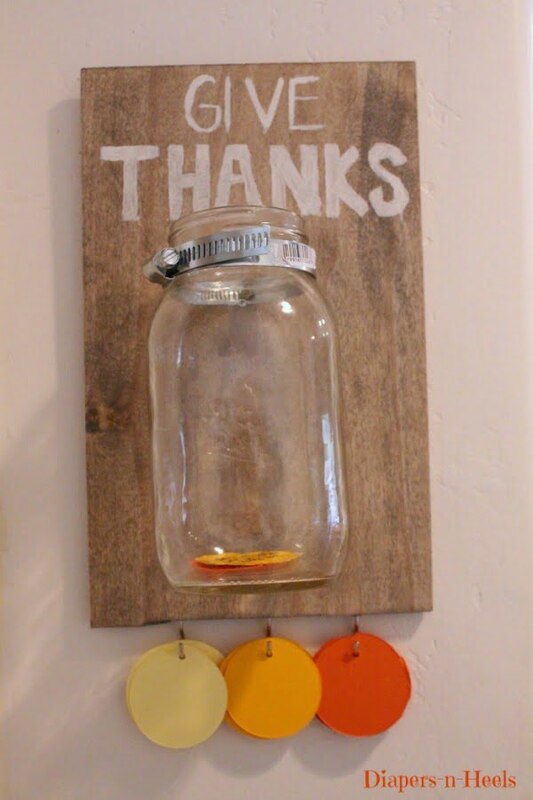 We love this idea for a “Thank You” jar to add your thank you notes and thoughts all year round. 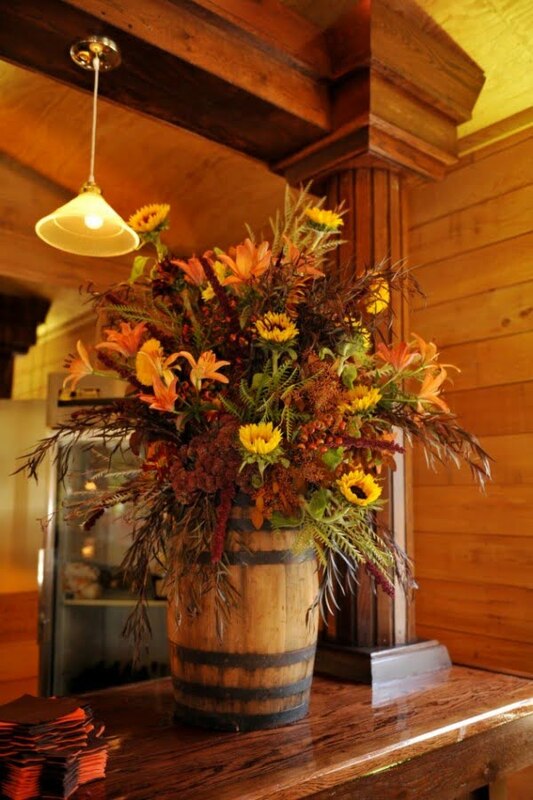 This lovely rustic barrel centerpiece idea is as good an idea for Thanksgiving decor as it is for any vignette anytime after the holiday. These elegant gold balls centerpieces are sure to bring the perfect blend of drama and sophistication to any Thanksgiving table. This tablescape created by these golden masterpieces will alert your guest to the fact that they are in for something extraordinary. These balls can also be hung from the ceiling for even more holiday awesomeness. This piece of pallet art is a beautiful way to get the spirit of Thanksgiving going in your home. With its simple reminder of the importance of being thankful, this art piece will add height and bring drama to your mantelpiece. The large white graphics remarkably contrast with the rustic boards to create a vintage yet modern vibe. This uniquely colorful and stunning creation will effortlessly inject fun into your Thanksgiving celebrations. Aptly displaying the colors of fall in a ‘proud peacock’ kind of way, this decorative piece is versatile and can be used in any way you see fit to spread the joys of the holiday. This mantelpiece décor has two metallic brown pumpkins anchoring six orange and brown blocks with each letter of the word ‘thanks’ printed on them. The raffia bows on top of the blocks add a quirky feel to these decorative pieces. These pumpkins and accompanying blocks are sure to bring your mantelpiece to life. Made out of a walnut shell broken along its seam, these salt cellars will add a dose of practical uniqueness to your Thanksgiving table. Armed with a butter knife, dinner guests will be able to have easy access to the amount of additional seasoning they desire. This tree makes the perfect centerpiece for the Thanksgiving table. It is made out of leafless branches placed inside a hammered metal container. A packet for each guest is attached to the tree. They are made out of small brown paper bags decorated with gold leaf stickers; chalkboard label clothespins are used to personalize the bags. A beautifully decorated table can set the tone for a fantastic celebration with your loved ones. These placemats are perfect for subtly infusing fun, creativity and a dose of the holiday spirit into your Thanksgiving festivities. The project requires only a few items: the fabric, a stencil, and markers made for the fabrics.